currently in preconstruction at 2254 Market Street, San Francisco. 2240 Market Street has a total of 48 units. 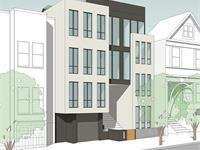 2240 Market is a mixed-use, transit-oriented development site in San Francisco’s Duboce Triangle neighborhood. Located in a quaint, walkable and eclectic part of town nestled away amongst tree-lined Victorian dotted streets, local shops with vibrant nightlife options in the Mission and Castro right around the corner. Your inquiry will be delivered to the developer / builder of 2240 Market Street, who will send you more information about this development.